This Mac BlackBerry Converter is a great video converter for a BlackBerry Curve/Pearl, BlackBerry 8800, BlackBerry 8300, BlackBerry 8100, plus, Tipard BlackBerry Video Converter for Mac supports multiple output formats, including AVI, 3GP, MP4, WMV, as well as convert video or extract audio to MP3, AAC audio format. ...... RMVB, WMV, ASF, QT, TS, MKV, AVI, 3GP, FLV, MPV, MOD, TOD, MP3, etc. In addition to multiple conversion formats, The BlackBerry users would find the video is easier to manipulate, edit it upon your preference with this Mac BlackBerry Converter, including merge several titles/chapters into one file, crop the video play region, trim the video length, and set video brightness, contrast, saturation, Hue, etc. A professional Mac BlackBerry Video Converter fully compatible with Mac OS X, support Leopard and Tiger, which manage on computers with either Power PC or Intel processors. 2. Support multiple output formats. Convert any video and audio to AVI, 3GP, MP4, WMV, as well as convert video or extract audio to MP3, AAC audio format compatible with BlackBerry. 3. High compatible with all types of BlackBerry. Qweas is providing links to Tipard BlackBerry VideoConverter for Mac 3.6.06 as a courtesy, and makes no representations regarding Tipard BlackBerry VideoConverter for Mac or any other applications or any information related thereto. 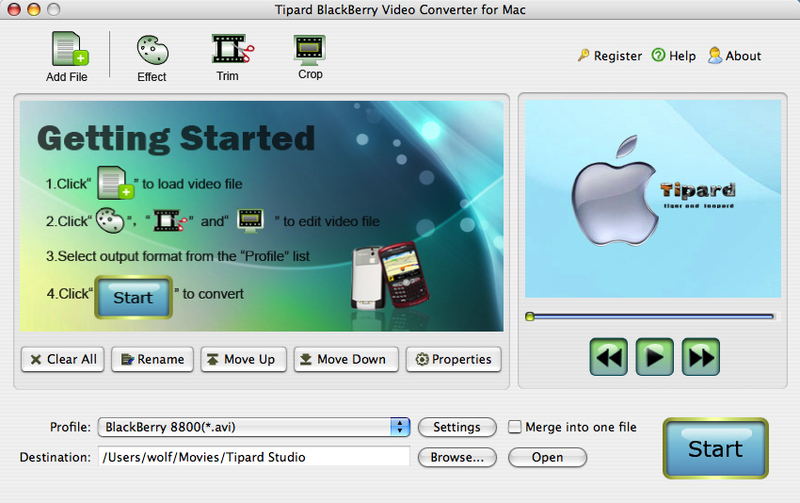 Any questions, complaints or claims regarding this application Tipard BlackBerry VideoConverter for Mac 3.6.06 must be directed to the appropriate software vendor. You may click the publisher link of Tipard BlackBerry VideoConverter for Mac on the top of this page to get more details about the vendor.